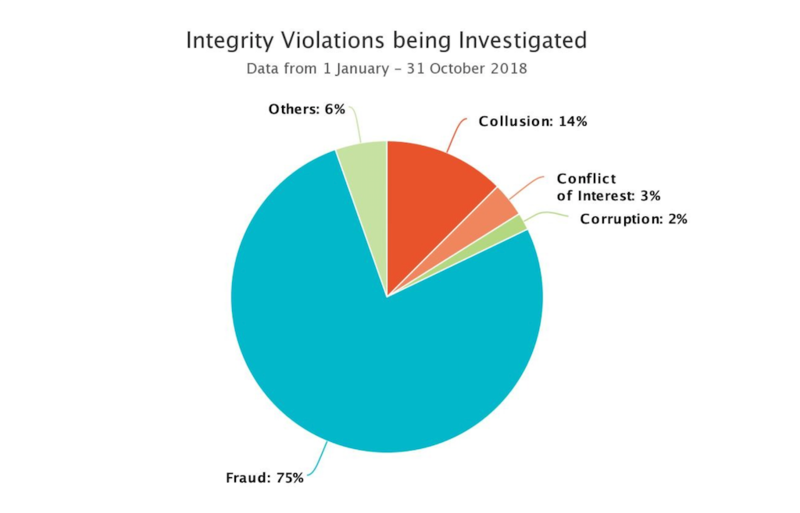 The Office of Anticorruption and Integrity at the Asian Development Bank has just released a pie-chart that provides valuable insight into the focus of its ongoing investigations into sanctionable practices. The key takeaway from the chart is that fraud, running at three quarters of all investigations over the last ten months, overwhelmingly makes up the largest slice of the investigative pie and corruption is the smallest slice at only two percent. These ADB figures for 2018 are generally consistent with long term trends across the MDBs where corruption cases may grab the headlines but in the vast majority of instances it is fraud that lies at the core of most of the enforcement action brought by their integrity offices. One question thrown up by the figures for corporates bidding on MDB funded projects to consider is whether they are matching this fraud risk with an equal proportion of their compliance efforts. Neil Macaulay, Co-Head of Chambers at Bretton Woods Law, believes there is a danger that the scale and nature of the risk of committing fraud can easily be underestimated by corporates when setting up their anti-bribery and corruption programs. Given that the base sanction for fraud and corruption violations are the same, with a three-year debarment start point, this could be a costly misjudgement. MDB investigators routinely focus on procurement frauds as they are generally more widespread and easier to identify and prove than other sanctionable practices such as corrupt bribe payments, which by their nature are more likely to be concealed. Typically, an MDB procurement fraud, known as a misrepresentation, might involve misconduct through a wide range of means including; failure to declare an agent or commission payments, embellished c.v. qualifications or performance track record, forged bid securities, false invoicing and mis-description of joint venture responsibilities. This list is by no means exhaustive and misrepresentations can occur at all stages of the bidding and contract execution processes and the misstatement usually appears on the face of the available project records, which help to explain why fraud carries the greatest risk of debarment and sanction in MDB funded projects.